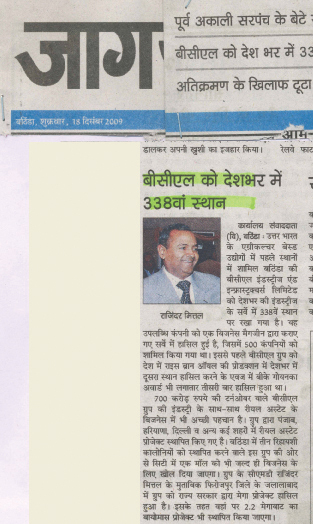 Placed in the first place of North India’s agriculture based industry, Bathinda’s Bathinda Industries & Infrastructure Limited Chemicals Limited of Shri Rajendra Mittal was ranked 338. This company was included among the 500 companies during the survey held by one of the business magazines. Before this BCL group had been placed second in nations rice bran oil production leading to its third consecutive B.K Goenka award held in December.